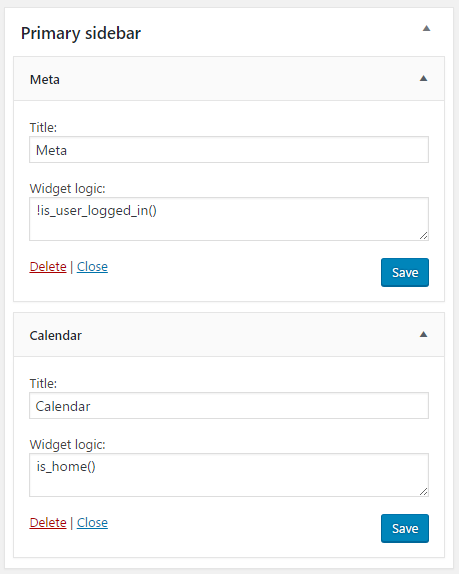 Widget Logic is a simple plugin could help you to decide the specific pages to show a widget by using WP’s Conditional Tags, or any general PHP code. Instead of creating many sidebars, you can drag all widgets you need into a sidebar and give them a condition in Widget Logic field to show in specific pages. The text in the ‘Widget logic’ should return ‘true’ when you need the widget to appear. is_home() — Widget will be appear if the current page is your website homepage. is_page('about-me') — Widget will be appear when the current page’s slug is “about-me”. !is_page('about-me') —Widget will be appear when the current page’s slug is not “about-me” (! (NOT) to reverse the logic). !is_user_logged_in() — Widget will be appear when a user is not logged in. is_category(array(5,9,10,11)) — Widget will be appear when the current page’s category is one of the given category IDs.